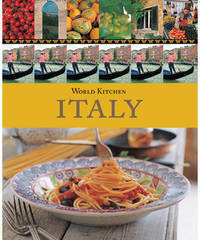 World Kitchen Italy explores the ways in which geography, climate, culture and tradition have shaped one of the world's most popular cuisines. It takes a look at the behind- the-scenes world of growers, artisans, chefs and home cooks, whose passion for produce helps maintain and reinterpret the regional styles and flavours of Italy's rich and varied food. More than 100 recipes including pasta, rice and polenta dishes, soups, salads, seafood specialties, pizzas, breads, vegetable dishes and desserts.